The much hyped Google's OS chrome is going to hit the market soon and you must be wondering whats so special about it. Is just another OS and will it be as successful as its mobile counterpart Android. 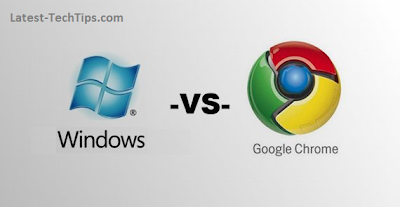 Google and Microsoft are very old rivals each one trying to outnumber in others territory. Microsoft tried launching Bing to compete with Google Search, but did not achieve as much success. And now Google is knocking back at Microsoft's door with a blow to its Operating System business. Means you don't need to install it. The operating system is on the web and Google will take care of the infrastructure. Its like a massive Operating system would be hosted on the cloud and various users around the world would simply have there individual accounts in it. Just like a gmail account. Can you believe it, if not then please believe you will no longer be required to have any storage space on your computer. No tension of data loss or hard disk crash., all the data is secure and backed up instantly. As expected it would be open source and it is built on Linux platform. We all know how robust Linux platform is and the Chrome OS is just an extension to its robustness. On November 19, 2009, Google released Chrome OS's source code as the Chromium OS project. As with other open source projects, developers are modifying code from Chromium OS and building their own versions. Wow I still remember the pain when Windows crashes and I need to reboot, reformat and reinstall, The data loss is a different story all together. With the Google's latest Chrome OS we don;t need to worry about data loss. It is expected that the Google Netbook will be launched in mid 2011 which is almost 6 months behind schedule. No matter what, just as we use a free email and the data still does not belong to us and we still use it, the same way we might use Google's Chrome OS. What say?